When I was at General Mills in August for Table Talk, I had the opportunity to try Progresso High Fiber Soups. 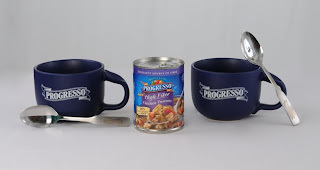 I really enjoyed the Tomato Basil and the Chicken Tuscany flavors, so I jumped at the chance to give away a can of Progresso Chicken Tuscany soup, 2 huge soup bowls and 2 spoons! The high fiber soups have no MSG, no artificial flavors, and 7g of fiber per serving! They taste great as well as being good for you. The Chicken Tuscany soup is well-seasoned, and has a little kick. Nate declared it "good, spicy, but good!!" To enter this giveaway (prize pictured below), leave a comment sharing your favorite soup! Isn't this a perfect set to usher in fall? Can you imagine yourself heating up a nice warm bowl of soup, and enjoying it in these great soup mugs with new spoons? For additional entries, follow this blog (and leave a comment letting me know), share this giveaway via tweet, blog, or facebook (and leave a comment letting me know). Comments will be open until Friday, November 13, 2009 at 6PM. Winner will be chosen using random.org to choose a random comment. Winner will be notified via email and must contact me with their address within 24 hours. If your comment profile does not include an email address, please leave an email address in your comment. Disclosure: I received a prize pack as pictured above for use in this review and was given the opportunity to award a prize pack to one of my readers via My Blog Spark. I received no additional compensation. The prize pack will be shipped from the PR firm. We enjoy the Progresso Minestrone soup. Also linked on FB. My favorite soup is - Southwestern-Style Vegetable. I love the Progresso New England clam chowder. So good on a cold day! I like lentil and the Chicken Tuscany - I also like chicken with wild rice! My favorite soup is homemade vegetable beef :) *Thanks* for the giveaway! My favorite soup is a homemade curry pumpkin. I love a big 'ol bowl of chicken noodle! I LOVE Tomatoe Bisque soup! YUM!! Zesty Santa Fe Style Chicken! I just subscribed to the blog but have been following you on twitter for some time. I just RT'd (I am DSinAZ on twitter) your link.